As one year ends and another begins, we’re often anticipating what the New Year will look like for members of the Esri community. Most of the road ahead is reasonably predictable. Esri is not revolutionary so much as it is an evolutionary company, evolving software and services in step with established trends in platforms, software, and related technologies. While that provides milepost predictability, there are still milestones looking forward. Here’s a summary look ahead and four key milestones that what we can expect during 2012. 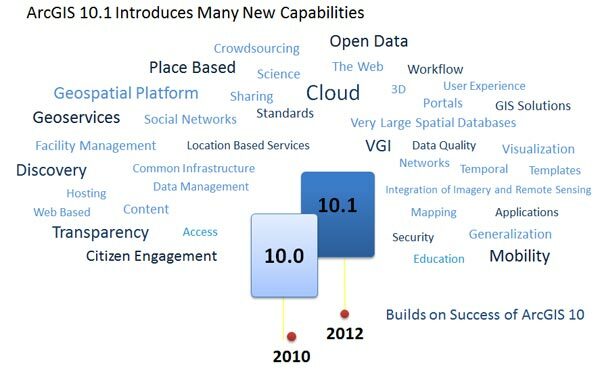 The release of ArcGIS 10.1 will be a major event this year, bringing to fruition themes of expanding online GIS, strengthening the server platform, adding key reinforcements to traditional GIS, expanding mobile capabilities, empowering developers, and more. Those might seem like the usual high-level list for any release, but looking behind the scenes this release promises to be more revolutionary than most, specifically in terms of online (read: cloud) capabilities that will evolve rapidly throughout the coming year. Here’s just one example: with an ArcGIS Online subscription any ArcGIS Desktop user can publish maps directly to the Web, making ArcGIS Desktop the premier map authoring and publishing console for Web maps and apps. Though the initial focus is on publishing maps, the mapping capabilities will continue to grow and will be complemented by off-the-shelf geoprocessing services as well as the ability to publish your own geoprocessing services as ArcGIS evolves online. From its initial focus on sharing, ArcGIS Online has been evolving to become a deeply essential part of your geospatial enterprise, supporting broader access to GIS across your organization and to a broader audience of knowledge workers and public geographic information consumers. Currently in beta, and synchronized with the 10.1 release, ArcGIS Online subscriptions offer the ability to publish maps and data directly to the Web, manage users and their roles within your organization, and establish catalogs and websites to create a destination for your GIS, creating an open and collaborative way to make your GIS more available and valuable. Moving your GIS online represents a new pattern, one that will fundamentally change the way you implement your GIS and make your information available to others. 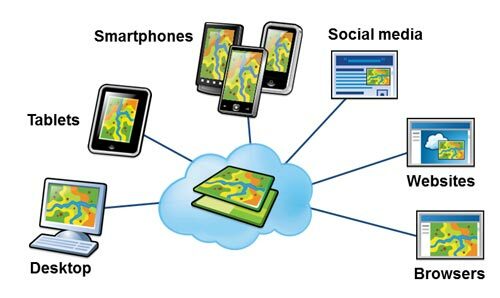 Your GIS won’t be all in the cloud (yet), but in the nearer term the cloud will make your life easier and complement your existing geospatial infrastructure. Esri supports a variety of geospatial communities, focused around industries like defense and intelligence, utilities, local government, public safety, and many more. These communities have common ground, but also specific requirements, expectations, and business needs. To meet these needs, focused information products, apps, and Web sites are major key to success. In the past you may have had to construct these from the ground up, but a series of useful maps, apps, and templates that are focused on specific communities is surfacing in 2012. These are organized into modules, can be extended and configured, and form the foundation for fulfilling common business patterns such as asset management, planning and analysis, field mobility, operational awareness, and citizen engagement. Local government templates and frameworks are already available and maturing, and you can expect more to come. There are over half a million apps available from the Apple app store, perhaps another quarter million or more in the Android marketplace, running the gamut from games to productivity tools to focused information delivery apps. In 2012 you can expect more lightweight focused solutions from Esri that are workflow driven and target key business functions where GIS provides significant value. But unlike many apps on your phone, these won’t be a somewhat random collection of compartmentalized solutions. Angry Birds and Words With Friends don’t need to interoperate or share a common foundation. But your mobile field apps, your information management consoles, and departmental and public apps do, and will be based upon a common geospatial framework that leverages intelligent maps, standard information models, and open data access. It’s also increasingly important for your organization to provide focused applications across many devices. PCs and browsers still rule, but to reach your target audience you’ll need mobile and tablet applications, and likely your own app store to serve your community. Templates are already available that help you create your own branded destination for your geospatial applications and assets. Stay tuned to major Esri events for updates on current trends and product evolution. The Esri Federal GIS Conference, Esri Developer Summit, regional conferences, and of course the Esri International User Conference are upcoming major events that present opportunities to learn more. See the Esri Event Calendar for an event near you.